The Perfect Natural Deodorant - Emz Blendz Soap Co. 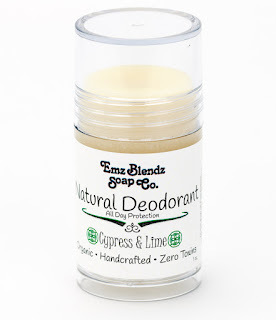 So don’t sweat a little sweat but you can still stay dry and smell great because Emz Blendz natural deodorant is formulated with powerful odor fighting ant-bacterial essential oils and moisture absorbing ingredients! If you’ve been using conventional not-so-natural antiperspirants or deodorants, your body may need to go through a short adjustment period to detox. Traditional deodorants are loaded with petroleum based waxes, chemicals and aluminum compounds that congest and clog your skin. For a few weeks while adjusting to your new natural deodorant, you may need to exfoliate your underarms daily with sugar scrub, a washcloth or a loofah sponge. Also, keep in mind that your sweat glands and pores in your pits have been blocked for quite awhile… As soon as you stop using your regular antiperspirant, you may notice that your body will go through a toxin-elimination period. During this time, you may notice a bit more odor and need to wash more regularly and re-apply your natural deodorant until your body adjusts. Don’t give up. Trust me, you will get through it. natural deodoranta try. I think you’ll be pleasantly surprised by how well it works and you won’t ever have to worry about the dangers associated with daily use of commonly used drug-store deodorant brands. You may actually notice, like we have, that after just a little while, all underarm odor disappears and you may even experience feeling naturally fresh even without any deodorant at all!